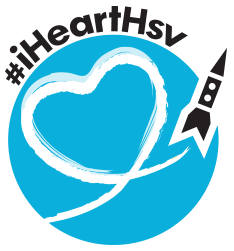 This is a serialized short fiction piece that we, The Rocket City Bloggers, are collaboratively writing for our Downtown with the RCB Event on January 16 at the al.com office in downtown Huntsville. Part One is at Huntsville Hashtag. Part Two is at Capturing Average. Part Three is at I Write Words on the Internet! … yet another flashback, this one to the early ’80s. This time, he was standing in the middle of The Mall, tossing pennies into the iconic fountain, with Lovemann’s visible in the distance and a yearning in his stomach to head a little ways down the Parkway to Dunavant’s Mall for lunch at Britling’s Buffet. “Enough,” Ray said to himself, as he realized passersby were giving him strange looks as he ambled sporadically in the midst of reveries of Huntsville past. Summoning all his willpower, he decided that he was going to eschew any further recollections of Twickenham Station or Argosy or the Whitesburg Drive-In long enough to finally actually open the door to the al.com building, despite the nigh-overwhelming temptation to fondly recall going bowling next door to the previous Huntsville Times building on the Parkway. As he entered, he was struck by how modern and professional the new al.com office was. He went upstairs, politely greeting the many friendly people who spoke to him, while keeping an eye out for Sandy’s familiar face. Being honest with himself, he was still a bit intimidated by the whole blogging idea. He knew there were some good stories in his father’s journal, but would other people think so? And what would these seasoned bloggers think of his idea to try and build a blog around those stories? It was hard to imagine any of these people wanting to discourage someone from blogging — you could tell there was a lot of passion in the room — but he certainly was in no hurry to discover he was the exception. So, one step at a time — find Sandy first. Well — OK, maybe find Sandy second, he thought to himself as he passed a table full of food from The Eaves. If you’re going to procrastinate, you might as well do it in style. And sampling the wares brought by The Brew Stooges wouldn’t hurt either. With a plate and glass in hand, he resumed his search, eventually spotting Sandy across the room, deep in conversation. Rather than go join in, Ray decided to use the opportunity to procrastinate a bit more by exploring the al.com office. The open areas he’d seen so far were fascinating, unlike any office space he’d been in before — an environment designed for reporters who spend most of their time wearing out shoe soles beating the streets of Huntsville instead of warming a desk chair. He started peeking into conference rooms, and was amazed at the view of downtown Huntsville. But then, in the depths of the building, something caught his attention. All of the other rooms had good, Huntsville-themed names. But not this one. 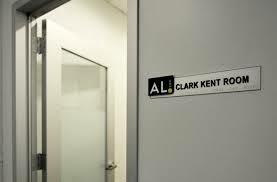 Not the “Clark Kent Room.” What did that mean? What lurked behind its door? It didn’t seem to be part of the public touring area, but Ray’s curiosity got the better of him, and he couldn’t help himself. He quietly turned the knob and pushed open the door. His heart skipped a beat. It couldn’t be. But it was. There, in front of him, right there in the al.com offices in the middle of downtown Huntsville, he found himself staring straight at ___________________. Part Five will be posted at Growing H.O.P.E. Come meet the Rocket City Bloggers on January 16 starting at 5:30. We’ll be in the al.com building hanging out with Downtown Huntsville Inc. We’ll have food from The Eaves and drinks from The Brew Stooges. Door prizes and networking opportunities will keep things lively.